Professor Elizabeth (Liz) Tanner is Professor of Biomedical Materials in the School of Engineering, University of Glasgow, appointed in August 2007. In parallel she has been a Visiting Professor of Biomechanics and Biomaterials at the Department of Orthopaedics, Lund University Hospital, Sweden since 1998. She graduated in Engineering Science from the University of Oxford and she stayed in Oxford to do her DPhil in biomedical engineering. Liz’s thesis was on measuring the movement at the fracture site in patients as their fractures healed, thus a biomechanics design problem. After completing her thesis, she joined Queen Mary as a postdoctoral research assistant working on a range of projects including the mechanical properties of bone from the hip joints of patients with osteoarthritis and the manufacture of degradable and non-degradable ceramic-polymer composites for bone support and replacement. Liz then gained a five year research fellowship which allowed her to work on biomechanics of osteoarthritic joints. Liz remained at Queen Mary becoming Lecturer, Reader and, in 1998, Professor of Biomedical Materials. In 1990 the IRC in Biomedical Materials was awarded to groups from Queen Mary University of London, the Royal London School of Medicine and Dentistry, The Royal Free Hospital Medical School and the Institute of Orthopaedics University of London and Liz was one of project leaders. This centre developed biomaterials from the basic science through in vitro and in vivo testing and finally clinical trials. During this time she was Deputy Director of the IRC in Biomedical Materials and Dean of Engineering. In 2001 the IRC hosted the 2001 European Society for Biomaterials congress in London, with Liz as Secretary General. WBC 2020 will be in Glasgow and Liz is one of the co-Chairs of the Organising Committee. While at Queen Mary she taught on the first Biomaterials degree in the UK and developed an intercalated degree in Clinical Materials to allow medical students to have a year out from their degrees to do a BSc including a major research project. At the University of Glasgow she designed and ran the first undergraduate degree in Biomedical Engineering in Scotland, the first students graduated in 2015 and the degree now takes about 50 new students per year. In 2001 she was elected a member of the Executive Council of the European Society for Biomaterials and 2005-2009 she was Secretary of the Society. In 2006 she was elected a Fellow of the Royal Academy of Engineering and she joined the Board of Trustees in 2016. 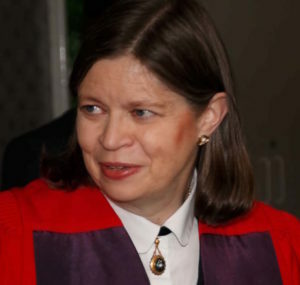 In 2015 she was elected both Fellow of the Royal Society of Edinburgh (FRSE) and Fellow of the European Alliance of Medical and Biological Engineering and Science (FEAMBES). In 2016 she was awarded Officer of the Order of the British Empire (OBE) in New Year’s Honours List. Liz Tanner’s research interests are in the fields of mechanical behaviour of bone, the development and testing of bone replacement materials and their clinical application with emphasis on the interaction of the mechanical and biological response to the implant and how these are controlled by the properties of the materials. In the mechanical behaviour of bone Liz started by looking at the effect of osteoarthritis and other diseases on the subchondral bone plate and cancellous bone of the human femoral head. Since then she has looked at the toughness and fatigue resistance of bone and more recently has returned to the effects of pathology by investigating the mechanical properties of the bone in a range of knock-out mice. In bone replacement materials she developed HAPEX, a composite of 40vol% hydroxyapatite in polyethylene which was commercialised by Smith & Nephew ENT and used in middle ear implants of 0.5 million people worldwide. Liz’s further studies included mechanical characterisation of HAPEX to consider its load bearing application and in injection moulding and selective laser sintering of various hydroxyapatite in polyethylene composites. All these hydroxyapatite polyethylene composites are non-degradable and while being modulus matched to bone, do not have sufficient strength for major load bearing applications. To improve the strength Liz developed fibre reinforced composites of PLA fibres in a PLA-calcium phosphate matrix, producing stiffnesses upto 8GPa and strengths over 100MPa, while retaining their strength for several months, thus potentially being able to be used for fracture fixation. For all these the testing has progressed from optimising the production route to in vitro and in vivo including measuring strengths of the interfaced developed between the implant and the bone. Finally she has undertaken mechanical characterisation of various biomaterials including bone cement.